Today is the 100th anniversary of the birth of author Roald Dahl, who was born in Llandaff, Cardiff, on 13th September 1916. To celebrate this occasion, Cardiff University’s School of Chemistry has tried to recreate some of the phenomena described in one of Dahl’s children’s books, George’s Marvellous Medicine. Enjoy! There’s been a lot of discussion in the news about changes to electoral constituencies in the United Kingdom proposed by the Boundary Commissions for England, Wales, Scotland and Northern Ireland. These proposals are intended to achieve two goals: (a) to reduce the total number of constituencies (and hence Members of Parliament) from 650 to 600; and (b) to ensure that the resulting constituencies contain roughly the same number of votes (within 5% either way of the mean number). In a bit more detail: each constituency in the UK should contain roughly the same number of eligible voters, the so-called “electoral quota” which is reached by dividing the total electorate of the UK by the number of required constituencies, except for the Isle of Wight and two Scottish island constituencies. The quota is then 74,769, based on the electoral register as it stood on 1 December 2015. The purported aim of (a) is to reduce the running cost of Parliament. I’d be more convinced of that if the previous Prime Minister hadn’t appointed no fewer than 260 Members to the House of Lords, at considerably greater expense than the saving incurred by losing 50 MPs from the House of Commons. The intention of (b) is more reasonable, but it does threaten the rationale of the constituency-based system as it creates some larger and less homogeneous constituencies. I reside in Cardiff West (marked 12 on the left). You will see that the proposal involves extending this constituency on the western side of the River Taff down towards Cardiff Bay. This splits the former constituency Cardiff South and Penarth (11) into two, the western part (mainly Penarth) being absorbed into a new constituency called Vale of Glamorgan East (20 on the right). 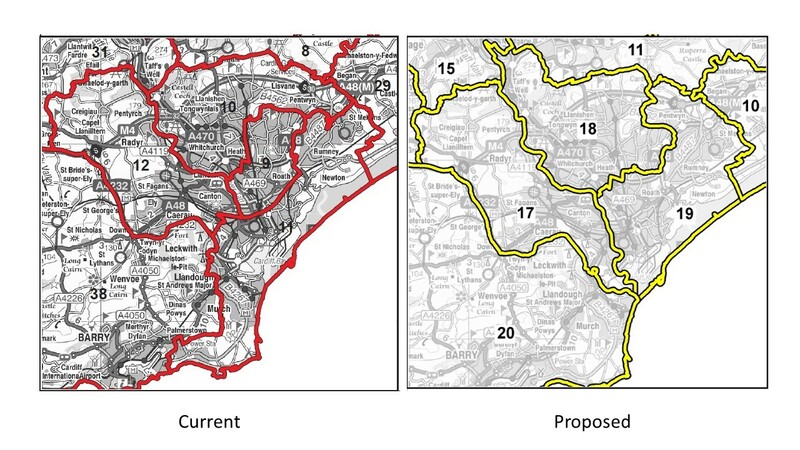 The other big change is that Cardiff Central (9 on the left) is eliminated entirely, absorbed by an enlarged Cardiff North (18 on the right, formerly 10 on the left) and a new Cardiff South and East (19) on the right. The net change is the loss of one seat in the City of Cardiff, which is currently held by Labour MP Jo Stevens. I’m sure there’ll be quite a strong reaction to these changes, not least because they are based on the electoral register as it was on December 1st 2015 because the switch to individual electoral registration meant that 770,000 names dropped off the list before this date. The list also does not reflect those who registered to vote ahead of the EU referendum in June. Going back to Wales for a moment, I think it’s unfair that while Scotland excluded two island constituencies from the quota formula to reflect their specific character, the same did not happen for Ynys Môn (Anglesey), a constituency which has been around since 1536, but which is now to be enlarged into a new entity called Ynys Môn and Arfon. I’m sure someone will comment on that! Anyway, these are proposals and there is now a period of consultation. The final boundaries will not be determined until 2018.